I mean it. This Pineapple, Bacon, Arugula Salad with a Pineapple Champagne Vinaigrette is our family’s new favorite allergy-friendly and gluten-free summer salad. It is so fresh and is absolutely bursting with flavor. The kids even asked for seconds with this one. Yes. Seconds on Salad. I will repeat just in case you are as shocked as I was. Yes. The kids asked for seconds on this salad. I admit to being on a bit of a pineapple kick lately. After all, I just recently shared my Pineapple Avocado Salsa and my Mini Pineapple Upside-Down Cakes. But I cannot help it. Pineapple is one of my favorite fruits and it completely reminds me of summer in so many ways. I figured if I could find a way to use pineapple in an appetizer, and also use it for a dessert, then why on earth could I not find a way to use it for a salad? So, of course, I did. Oh, and do not even get me started on the dressing for this. I have been eating it by itself with a spoon. It is just ever-so-slightly addicting, in a totally good way. So, if you happen to be a fan of this enzyme and anti-oxidant rich fruit that is just bursting with health benefits, then I think I can go out on a limb and safely say you will really like this salad! 1. In blender, mix together: Pineapple, Champagne Vinegar, Shallot, Sea Salt and Pepper. While blender is running, slowly add in olive oil until dressing reaches desired consistency. Chill dressing until ready to use. Can be made ahead of time. 2. 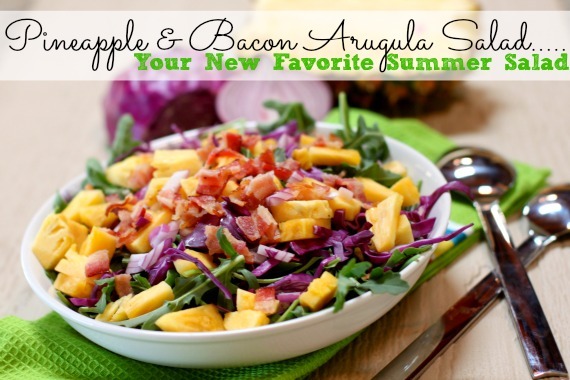 In salad bowl, add: Arugula, Cabbage, Red Onion, Pineapple, Avocado, and Crumbled Bacon. Toss with just enough dressing to coat greens lightly. Note: This would be a wonderful main dish salad if you added Shrimp. 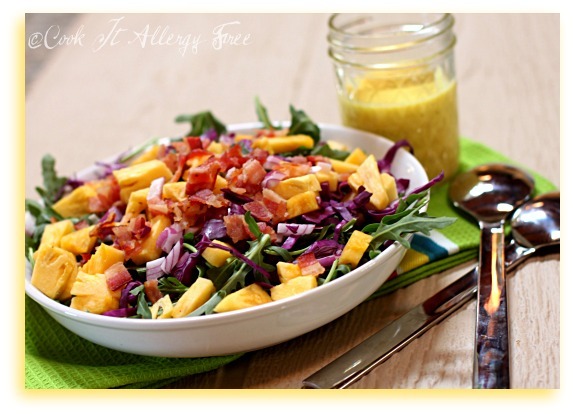 Kim, I love the pineapple dressing – it sounds so sweet and delicious, and what a beautiful colorful salad to go along! I love arugula in salads – will have give this a whirl! Thanks, Jeanette! I love arugula too. There is just something about the peppery bite that it has. Goes really well with the sweetness of the pineapple! Not only are the colors of this beautiful, but the flavor combination sounds amazing! I’m loving summer produce now too! I love how vibrant summer foods are. Seriously, this looks amazing! Thanks so much, Sarena!! I totally love summer produce too! It makes me so excited to walk into my local Whole Foods! So much to choose from at this time of year! Hmm…have to forgo pineapple for a bit according to some recent blood tests (urrg! ), trying to think of something else that might work in place? Maybe mango? A combo of citrus/mango? What do you think? Tessa, I think that a mango-citrus combo instead of the pineapple would be amazing in this! Let me know if you try it and what you think. If it works well I will add the suggestion with credit to you! 😉 Love that idea! Got some fresh mangoes at the market yesterday…I’ll let you know how it turn out! Success! My Manila Mango (or Thai, Champagne, Yellow whatever you’d like to call it!) was just slightly tart rather than sweet, so I left the citrus out, there was enough zing with the vinegar. It looks just like the pineapple variety, and my oh my, it IS delicious! I am enjoying it right now…yum! I also used baby greens instead of arugula b/c it’s what I had on hand. A keeper, for sure…..
Mmmmmmmmmmmmmmmmmmmmmmmmm! Kim! I am so trying this. I think my Dad will love it, he’s a big pineapple fan, as am I. I like the combo of ingredients in here. I bet it would be good with tempeh bacon! 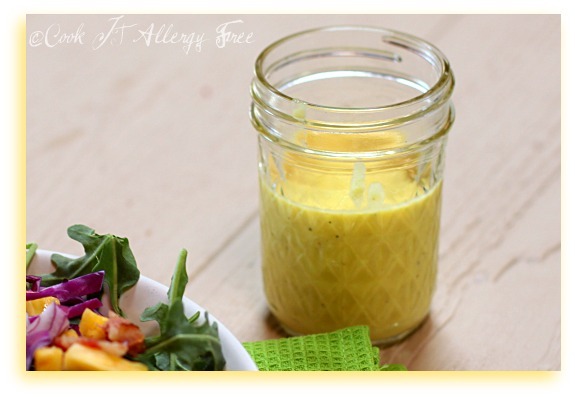 I love the pic of the dressing, I always use mason jars to store my dressings too! So much easier. this mat be the culminatuon of some of my favorite ingredients…. BRILLIANT!!! Mmm- bacon! I think there is a cookbook called “Everything Is Better With Bacon”! Bacon is one of my guilty pleasures for sure and combined with pineapple and arugula- yes, please! The colors af your salad are just gorgeous too. How yummy! Fresh pineapple is amazing isn’t it and combined with the rest of those ingredients, wow! this sounds heavenly. I can’t wait to eat it. Beautiful pictures. I just found your site and I love-love-love it! Thank you for such a wonderful resource! I’ll probably be doing a variation of your goat cheese stuffed figs (sans the goat cheese) for a post tomorrow. Thanks again! Kim this is stunning! Just reading the ingredients made my mouth water. Sounds like a really great combo of flavors and I am in the “everything is better with bacon” camp myself! Can’t wait to try this! Oh my this sounds good! I too adore pineapple.